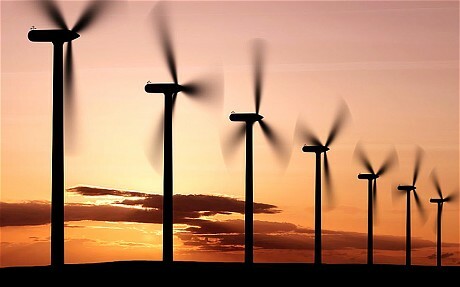 Wind Power - An alternative source of energy In the world's search for feasible alternative energy, wind power has offered the most promising and realistic solution. What is a wind mill and how does it work? A type of machine which can convert wind energy into electricity (or) which can be used for grinding grains (or) pumping water. 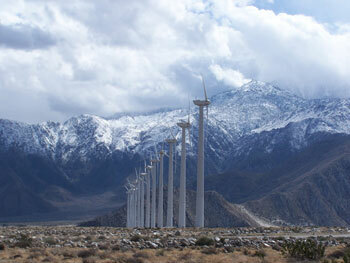 Now a days modern wind&dash;mills are used to generate electricity which are known as wind turbines. These wind&dash;mills in general have a large fan to generate electricity with three horizontal blades fixed to a rotor. Wind turbines use large blades to catch the wind. As the wind blows it rotates the turbine and thereby generating electricity. Usually, Stronger the wind then greater will be the electricity produced. Diversity of Wind mills There are two main types of windmills used today: Pole-mounted windmills and building-mounted windmills. Pole-mounted wind mills although more expensive than building-mounted turbines, they produce a lot of electricity. There are two types of wind mills. They are pole mounted and building mounted. Pole mounted: These wind mills generate 5 kW to 6 kW of power when they are placed in a suitable Horizontal position on a tall pole. Building mounted: These are smaller mounted system which can be installed on the roof of a building. The power produced by these type of wind mills is about 1 kW to 2 kW. If the turbine is not connected to the power grid, then the unused power can be used to store electricity in a battery. 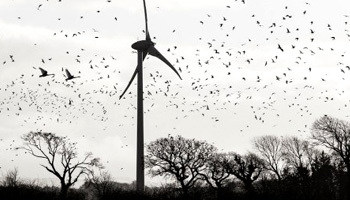 These slowly rotating blades of the wind mill could even kill bats, other birds, but not as many as the power lines do. As we know that winds may not be constant all the time, the electricity from a wind mill cannot be continuous, no power would be generated if there is no wind. Working Principle of Wind mills It is basically the conversion of the wind energy into the mechanical energy of the turbine and then finally to electricity. 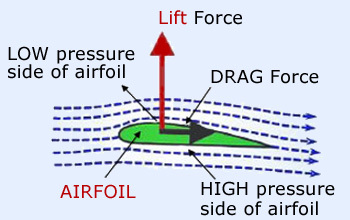 In windmills the wind passes through the airfoil section of the blades and the lift produced generates a torque which is then transformed to electricity in the generator. Lot of wind mills have been installed all over the world generating 70,000 Mega watts and if the same pace of growth continues, then the scientists predict that by 2050 more than one thirds of electricity will be produced by the wind mills. In general these wind mills operate on a simple principle, as the wind blows the turbine rotates, the blades of the wind mill are connected to a rotor. The rotor is connected to the main shaft, which spins a generator to generator electricity. Usually the wind turbines are located on the hill tops to capture most of the energy. Sometimes these wind mills can break when the power of the wind is too much. Today&apos;s turbines are lighter, robust and also more efficient than other traditional wind mills. The wind energy becomes the best alternative for the growing needs of the modern day world. It doesn&apos;t make any pollution to the environment. Wind Turbines used as power source Wind energy is the fastest growing source of electricity in the world. Till now, nearly 45,000 megawatts (MW) of new capacity were installed worldwide. 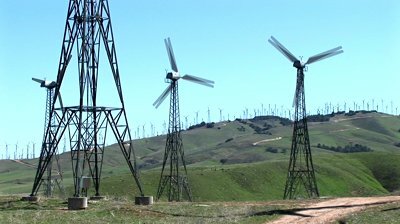 Why are wind turbines used as a power source and how? Concerns about pollution resulting from the production of electrical power have led to the development of wind turbines. The wind generators are more like giant propellers with two or three blades, called rotors, mounted on top of tall towers of steel or concrete. The rotors turn a shaft which drives an electric generator. The size of the blades and the height of the tower determine how much electricity the machine can generate. Wind generally gets stronger as you go higher, and the power of the wind you capture depends on the swept area of the blades. Double the length of the blades and the power increases four–fold. More important still is the speed of the wind, for the power that can be extracted goes up as the cube of wind speed – if it blows twice as hard, there is eight times as much power to be had. Wind generators must point in the right direction, either directly towards the wind or directly away from it. The rotors mounted on the turntable are connected to sensors through an electric motor which tell it which way to face. This problem of wind direction can be avoided completely if the blades are mounted on a vertical rather than horizontal axis. Physics of wind mills A wind turbine is used to harness the kinetic energy of vast amounts of wind, and transform it into electricity. The wind turbines are governed by several physics principles, the most important of which is the idea of lift. As per the Bernoulli principle the lift would be generated by the rotor blades as the wind hits the blades. Here the force on the turbine is perpendicular to the direction of the wind. Usually the wind turbine is driven by this force. The velocity of the wind mills increases with the height of the wind mills. Newton&apos;s third law explains the the reason for why the force on the wind is equal to and opposite trust of the wind mill. As per the Betz limit no wind mill can catch more than 59.5 % of kinetic energy of the wind. Vertical axes wind turbine (VAWT) Vertical-axis wind turbines (VAWTs) are a type of wind turbine where the main rotor shaft is set vertically and the main components are located at the base of the turbine. 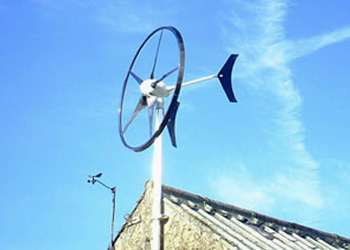 HAWT: Horizontal Axis Wind turbines are propeller based turbines that are traditionally mounted on tall poles and are used in hil tops and village farms. These HAWT&apos;s blades rotate vertically. HAWT&apos;s will work if we have large tower or hilly areas with a consistent wind direction. 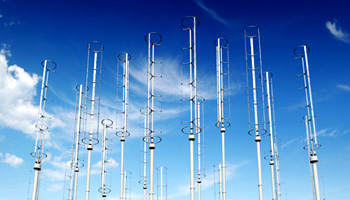 VAWT: Vertical Axis Wind turbines are the ones that include a vertically tall air foil style and a solid winged style. These have curved blades that look like a egg beater and rotate about the vertical axis. A VAWT maybe a better option if your wind changes directions and you cannot put up a structure taller than 30 feet. Swift wind turbine The Swift wind energy system is the world’s first building mountable wind turbine, with unique patented aerodynamic technology for unprecedented silent, safe, effective energy for homes and businesses worldwide! This type of Wind turbine is classified in to pole mounted wind turbine, that can generate electricity by conserving the wind power (A Renewable Energy). The Swift provides a most efficient, Safe and silent operation. 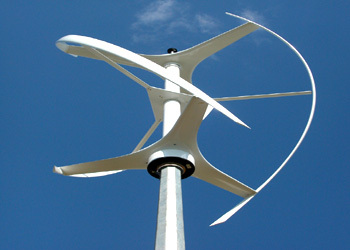 The technical team that made the swift wind turbine offers Quiet and minimal vibration structure that is fixed on a pole. The ease of installation can be a major break through compared to other traditional wind turbines. The design of the swift is eye cache. It operates below the noise levels and there is no restriction on the height of the swift. In general this structure of the swift would be mounted on an aluminum. For optimal performance it is mounted on the highest point on the roof of the building. Windspire Turbine These are ultra quiet, Wind spire wind turbines which gives the power to create clean energy from the natural wind just outside your door. 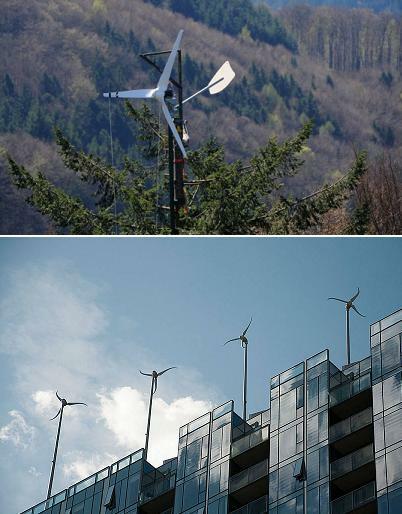 At only 30 feet tall and four feet wide, windspire wind turbines are appropriate for almost any urban, suburban and rural environment. This system of wind turbines was founded in the year 2005 to innovate and develop a new technology that introduces a new style and function to wind industry. These type of wind turbines generate power as the wind blows against the vertical airfoils causing them to spin. This power is then converted to AC electricity directly and is immediately available to provide energy to your building, unlike traditional pole mounted systems which have a separate unit for conversion. The basic principle behind Windspire is simple which says stronger the wind, more power would be generated. During the average wind cycle, Windspire generates 2000 kilowatt hour annually. The wind spire turbine was designed to work even in areas with average wind speeds(10 mph), however its operation will be at its best if the winds are 11 mph. These Windspire turbine technology can be used in Schools, Houses, Resorts, Agriculture, Parks and Museums,etc. Rotating blades of a turbine may hit the birds One of the most commonly repeated criticisms of wind power is that it kills birds. The giant spinning turbines are basically bird death traps. Wind energy is a renewable source of energy. It has no pollution effects, it doesn&apos;t require any fossil fuels for its operation. The wind forms near the residential areas could decrease the property value of the site. The large wind turbines just make a whooshing sound which are far below the noise levels, making them quiet and reliable. The large rotating blades of the rotors pose a threat to the birds which would kill around 10 birds on an average per year. Most of the land used for the wind mills is empty and could be used for agriculture. Sometimes the wind power may be very low and hence the turbine may tend to o to an idle state. Thus continuous power cannot be obtained fro these turbines.